Hitting a 52-week low is bad, but hitting a three-year low is worse. Shares of Plug Power (NASDAQ:PLUG), a leader in fuel-cell solutions, plummeted 11% in November following a disappointing earnings report and a presidential election outcome that may prove unfavorable to the industry. The stock reacted sharply to news of Donald Trump's victory, trading as low as $1.18 per share the day after the election -- a 52-week low. Even more disheartening was the fact that shares hadn't traded so low since December 2013. 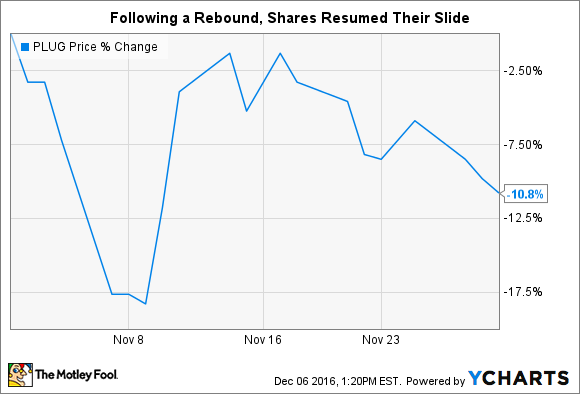 Releasing its third-quarter earnings on Nov. 7, Plug Power's management tried to paint the company's performance in a positive light. For one thing, the company's backlog continued to grow, and management remained optimistic that it will achieve its target -- 34% growth year over year -- of $275 million in bookings for fiscal 2016. The company also reported a third consecutive quarter of positive GAAP gross margin, which has expanded from 1.1% in Q1 to 2.2% in Q3. But highlights like these didn't distract the market from the more concerning issues. During the earnings report, management failed to adequately address its inability to keep spending under control. In the beginning of the year, management identified a target of using less than $20 million in operating cash flow for fiscal 2016. And although the company reported approximately $16 million in negative operating cash flow through the first six months of the year, management maintained confidence that it can achieve its $20 million target. In the third quarter, management reported $14 million in negative operating cash flow, bringing the total through the first nine months of the year to $30 million. However, the stock's sell-off following the election was much more than a knee-jerk reaction: It was predicated on the fact that the fuel-cell industry is still heavily reliant on tax incentives. Those incentives, which are seen as a necessity for the industry's growth, have expired due to what some legislators characterized as an "oversight," and their extension remains in a state of flux. And the election of Donald Trump, who has claimed climate change is a "hoax" and stated an intent to reject President Obama's Clean Power Plan, doesn't seems like an auspicious sign for the industry. The obstacles remaining before Plug Power are not to be underestimated. Though the company has reported continued success in growing its top line, it has similarly reported continued failures in growing its bottom line. And as the company continues to report excessive operational cash outflows, it's safe to say that profits, if there are to be any, are far beyond the horizon. As if this wasn't reason enough to give investors pause, the extension of the fuel-cell tax credit, so vital to the industry's success, remains doubtful at best.